One of the words for the latest round of the Scavenger Hunt was "balance." Now that the hunt reveals have happened, I can show everyone the image I came up with, and talk about what went into it. The first thing I do when I get a scavenger word is do a mind-mapping exercise to come up with ideas. I write down all of the words I associate with balance - balanced cheque book, high wire act, juggling, black and white, justice etc. I originally had the idea of an action figure (I normally shoot toys for the hunt), balancing a cheque book while in the middle of a high wire act. I liked the concept, but it ended up being to complicated to put into one image. So I was stumped. Then I flew to Europe. 12 hours being stuck in airports and third class seats gives ones mind a lot of time to wander, and my mind wandered over the word balance a couple times. I started thinking why don't I have an action figure balancing on a surf board. I've done surf boards before for the hunt, so how about a ball? Better yet, how about balancing on a board which is balancing on a ball? I couldn't think of which action figure to use, so I mused that I could just do a self portrait. For the past dozen hunts or so I had only submitted toy images, so this would be a huge departure style-wise, and I didn't want to disappoint my fan base. However art trumps tradition, so I decided to go for it. Then in a moment of clarity the whole idea clicked. 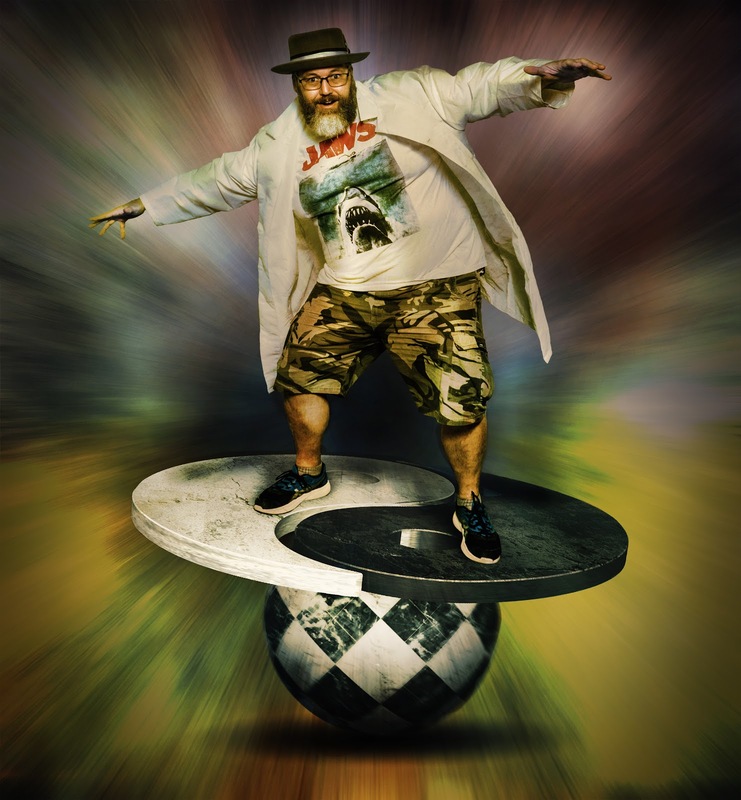 Yours truly, balancing on a stone yin yang, on a stone ball, all in motion. Balance all the way down. So, how did I get this shot? The answer is building it piece by piece. Photoshop has a decent 3D modeling engine built into it, so I used that to make the ball and the yin yang. I made them as separate pieces, and stuck em together. The ball is just an image of floor tiles made round. 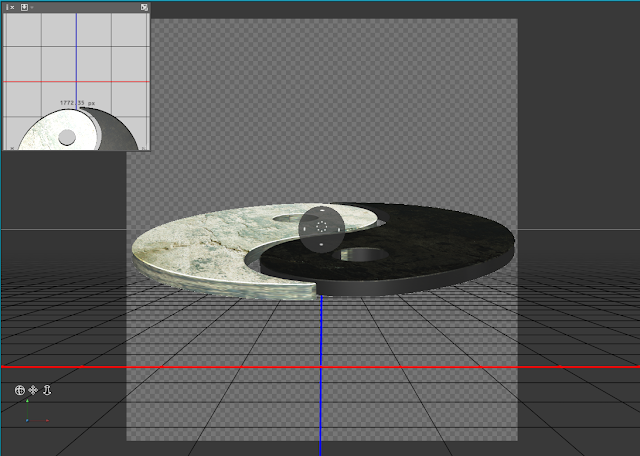 I used a concrete texture I took in San Francisco a few years ago for the stone look of the yin yang. Why is the yin yang stone? No reason, just seemed right to me. The tunnel effect is several textures stacked on top of each other, all blended together with a radial blur, and some selective darkening in the center to give a receding into the distance tube effect. Finally it came time for me to shoot myself. I positioned a light in front of me and up about 30 degrees. At the last minute I decided to put on a lab coat, and use fans to blow on it, so I would have a "blowing in the wind" effect to add more of a sense of motion to the image. I hadn't given much thought to my own wardrobe. At the last minute I decided to do an homage to Gord Downie. If you are not familiar, Gord is the lead singer of a Canadian rock band called the Tragically Hip. He died of brain cancer last year, but before he passed, the Hip did one final tour across Canada. His stage outfit for that tour was a Jaws t-shirt, and a jaunty looking hat. I have been a fan of The Hip for decades, but I have been listening to them a lot lately, as part of my recovery from depression. So it seemed fitting as a silent homage to Gord, thru his music, helping me regain mental balance. In the most fanboy moment I've ever experienced, I had a replica hat made by the same milliner who made Gords hats for the tour. I also bought a Jaws t-shirt. So already armed with fanboyness, I had my wardrobe. The rest of the processing was the basic steps of masking, tone matching and adding shadows that goes along with any composite work. So that is the story behind my image for the word "Balance".